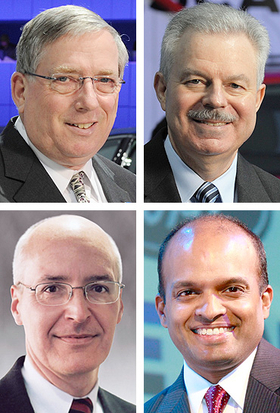 Ford executives (clockwise from upper left): Lewis Booth, Derrick Kuzak, Raj Nair, and Bob Shanks. DETROIT -- Ford Motor Co. CFO Lewis Booth and global product development chief Derrick Kuzak -- key architects of the automaker's recovery -- will retire on April 1. Booth, 63, will be succeeded by Bob Shanks, Ford's vice president and controller, the automaker said today. Kuzak, 60, will be replaced by Raj Nair, who is currently vice president of engineering for global product development. Ford said Shanks and Nair will assume their new roles on April 1. Booth has been mentioned as a possible successor to Ford CEO Alan Mulally, who will turn 67 in August. Mulally offered no hint today about his retirement plans but said Ford has a deep executive bench. "Ford is absolutely committed to a robust succession plan," Mulally said on a media conference call today. Mark Fields, head of Ford's Americas unit, and Joe Hinrichs, the top executive in charge of Ford's operations in China and Asia, are considered front-runners to succeed Mulally. In other changes, Stuart Rowley, 44, CFO of Ford's European operations, will succeed Shanks as vice president and controller. Hau Thai-Tang, 45, currently executive director of global product programs and former chief engineer for the Mustang, was named vice president of engineering for global product development. "Lewis Booth and Derrick Kuzak represent the very best of Ford and our culture and built a legacy of leadership, integrity and commitment to excellence that will benefit us for years to come," Bill Ford, the automaker's executive chairman, said in a statement. "Lewis and Derrick were absolutely integral to the comeback of Ford and they are retiring with our deepest respect and gratitude." Ford has posted three straight years of profit following losses that totaled more than $30 billion from 2006 through 2008. Booth joined Ford in 1978 as a financial analyst in product development in Europe. He later led operations for Ford in South Africa and Mazda before being tapped to head Ford of Europe and the Premier Automotive Group, Ford's former family of European premium brands. Shortly after the 2008 collapse of Lehman Brothers triggered a global financial crisis, Booth was named CFO. Separately, Ford said Jon M. Huntsman Jr., former Republican candidate for president of the United States and ambassador to China, has been elected a director, effective immediately. "Jon brings to Ford's board of directors extensive global knowledge and experience -- particularly in Asia with trade issues -- and operational experience gained as governor of Utah, a state that has grown jobs even during the economic crisis," said Bill Ford. "Jon understands the importance of strengthening the country's manufacturing base, which will contribute to our success going forward." Huntsman, 51, was twice elected governor of Utah, serving from 2005 to 2009. His public service career began as a White House staff assistant to President Ronald Reagan and has since included appointments as deputy assistant secretary of commerce for Asia, U.S. ambassador to Singapore and deputy U.S. trade representative.